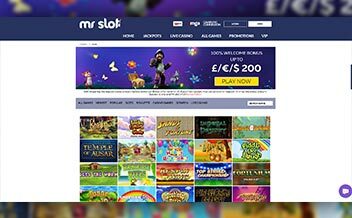 Founded in 2016, Mr. Slot Casino is a new entrant in the competitive online gaming world. The Casino, owned by ProgressPlay Limited Casinos has started off well by offering players diverse slot and game selections from some of the renowned developers. 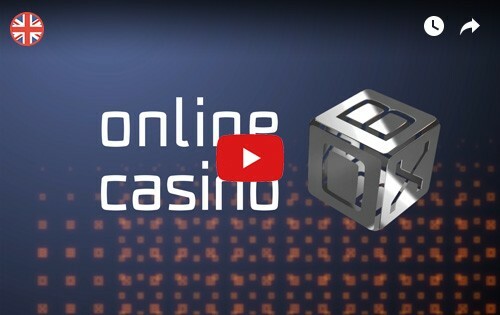 The Casino offers virtual games, live dealer games, and lots of specialty games. 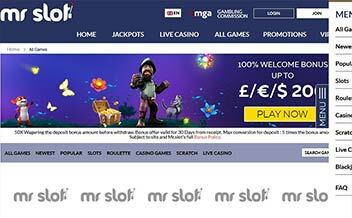 Mr. Slot Casino has already made a name for itself in the two years that it has been in business. The Casino has brought on board more than five well-known developers which have made sure that players enjoy an amazing assortment of slots and games every time they play in the Casino. The Casino also has a mobile version where players can play while on the move, alluring bonuses and promotions, and a professional and committed customer support team. Indifferent to other Casinos, Mr. Slot Casino offers players with an alluring welcome bonus as well as in-play promotions that are meant to keep players enticed and playing more. First-time players can enjoy 100% match up to €200 within the first 7 days of registration. To withdraw the bonus and winnings, the player must wager the amount at least 50 times. Other than the welcome bonus, the Casino has other promotions for existing players that include cash back and match bonuses through specific days of the week. The Casino has a number of Jackpots provide players with a chance to win big with a small stake. The jackpot games are tailored to ensure that punters have an amazing experience while trying their luck. Some of the games available include Deck the Halls, Cash Splash, King Cashalot, among others. 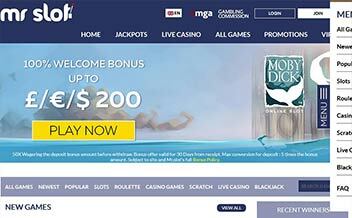 Mr. Slot Casino which is powered by a number of renowned developers such as Microgaming, NetEnt, NextGen Gaming, among others, has over 300 slot games from which players can enjoy. Some of the games that are available in this section include Starburst, Tomb Raider, Thunderstruck II, Jimi Hendrix, Gonzo’s Quest, among others. Table game fans are assured of unmatched experience at the table games section of the Casino. The games in the section are tailored to match the needs of the diverse online gambling market. These games include Blackjack variants, Baccarat variants, and Roulette variants. The Casino also has a live dealer section where players can enjoy their favorite games in real time and from the comfort of their home. The section meets the needs of the players that like the live experience. Some of the games include live versions of Roulette, Blackjack, and Baccarat. Video Poker fans are not left out either. Mr. Slot Casino offers one of the most incredible variants of video poker that give players a chance to play and win regardless of their stake. Some of the games include Deuces Wild, Double Bonus Poker, among others. The Casino is powered by renowned developers whose collaboration has given rise to a diverse and attractive software that promotes gameplay. The software has a user-friendly interface that makes playing at the Casino fun. Some of the games available include Microgaming, NextGen Gaming, NetEnt, Thunderkick, 1*2 Gaming, Elk Studios, Rabcat, and 2 By 2 Gaming. The United States, Italy, Spain, France, Germany. Hungary, Denmark, Australia, Bulgaria, Estonia, Slovenia, Turkey, Portugal, Lithuania, Ireland, Greece, among others. 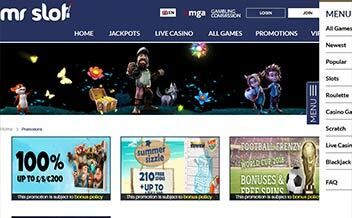 Players can access their favorite games in Mr. Slot either by instant play or mobile devices. This means that there is no need to download files to enjoy the Casino and punters can play from anywhere. The Casino can be accessed using both IOS and Android mobile devices as well.  Mr. Slot Casino run on major browsers such as Internet Explorer, Chrome, and Mozilla. Mr. Slot Casino offers players an amazing platform where players can seamlessly enjoy amazing slots and games, alluring bonuses and promotions, solid customer support, and SSL encryption security protocol. So, overall, the Casino is worth checking out.